What Kind of Doomer Are You? This interview was inspired by David Holmgren's piece "Crash on Demand". There has been a lot of response in North America and Europe to the idea that we try to undermine the economic system (legally) in order to save the world from climate destruction. Read more about What Kind of Doomer Are You? Free to watch, Anima Mundi starring the co-founder of permaculture, David Holmgren, Michael Reynolds (Garbage Warrior), Michael C Ruppert, Permablitz, Noam Chomsky, Vandana Shiva and others. Directed by Peter Charles Downey. 77min. Anima Mundi (2011) - permaculture, peak oil, climate change and the Gaia theory. 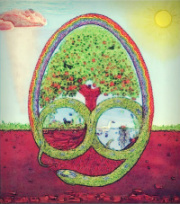 Documentary movie on the Rights of Mother Earth and permaculture of the inner landscape. Featuring a stellar international cast of top environmental thinkers and activists including Vandana Shiva, Dr Helen Caldicott, Polly Higgins (ecocide), Starhawk (permaculture), Father Bob Maguire, Cormac Cullinan (Wild Law), David Holmgren (co-originator of permaculture) and Michael Reynolds (earthships) amongst others. A homemade grassroots independent film self-funded by the director, Peter Charles Downey. The word Permaculture is a marriage between the words permanent and culture. The most fundamental ethics of permaculture are care for Earth, care for people and fair share of abundance; a true existence in harmony with nature. Read more about New collaborative project: Permasynergy! Permaculture, Peak Oil, Climate Change and the Soul of the World. Read more about Permaculture, Peak Oil, Climate Change and the Soul of the World.